In today's high-speed culture, sensible human nutrition has been sidetracked by convenience foods and fad diets. Attempting to cut through the hype can be overwhelming for anyone, even when you have the best of intentions about adopting healthier eating habits and committing to long-term wellness. Fortunately, wellness expert Brett Blumenthal has created a straightforward diet and nutrition program to demystify the secrets of healthy eating once and for all. She identifies five simple principles, founded in fact, that can easily be applied in everyday life. Her "GET REAL" toolkit outlines tips on establishing proper portion size, shopping smart at the grocery store, and making healthy substitutions in cooking, along with advice about exercise, hydration, and stress reduction. And with forty pages of simple, satisfying recipes at your fingertips, you can jump-start your nutritional makeover the tasty way, at breakfast (Mushroom and Asparagus Egg-white Omelets and Pleasantly Surprising Whole-grain Pancakes), lunch (Spinach, Raisin, and Chickpea Salad with Chicken and Farm Fresh Italian Calzones), and even dessert (Grandma's Chocolate Clusters and Summer's Over Apple Crumble). 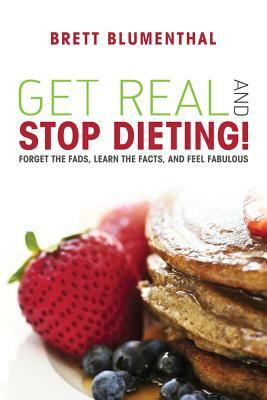 Hailed as "the 'diet book' for people who hate diet books," "GET REAL" and STOP Dieting will inspire, empower, and motivate you to live a healthier, happier life.